"Focal Banger is an American India Pale Ale. We have a real love for IPAs here at The Alchemist, and we strive to offer you the best hop experience we possibly can. This beer is brewed using Citra and Mosaic hops and our favorite British malts. Truly, an abundance of hoppy goodness..."
We'll begin the trio of Alchemist Beer reviews this week by starting off with their single IPA, Focal Banger. For those unfamiliar with The Alchemist, they are most known for their DIPA Heady Topper, which is regarded as not only one of the best DIPAs in the world, but one of the best beers period. Fans were dealt what was thought to be a crushing defeat several years ago when The Alchemist closed the doors on their retail shop amidst complaints from neighbors who hated the barrage of visitors traveling up and down their street and (apparently) using their driveways for parking and places to turn around. Rather than risk any legal action, the retail shop was closed to the public. Alas, the phoenix rose from the ashes and on June 30th, 2016, The Alchemist opened the doors on their brand new brewery. As of now, they offer three beers: Heady Topper, Focal Banger, and The Crusher. They sprinkle in other offerings from time-to-time, but the most important thing is that the retail shop is open for business. 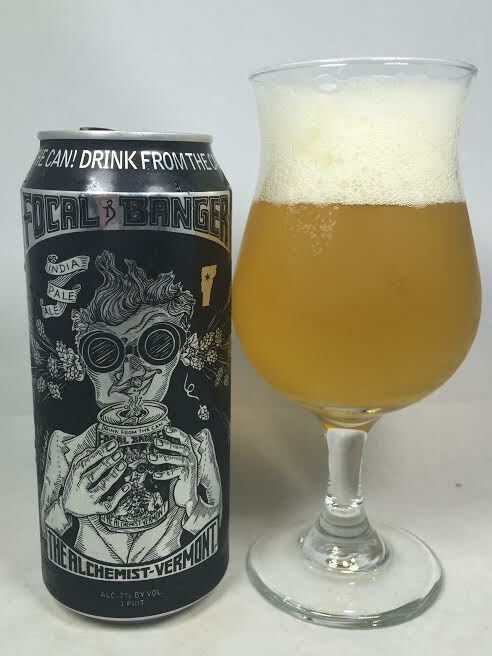 Focal Banger has been available for consumption at local bars for quite some time, but the only way you used to be able to purchase cans to take home was via random pop-up tent sales which were usually announced just a day or two prior. Needless to say, being able to acquire this was a daunting task. Yet, here I am with a can in my possession. I have actually had this before when it was only available for purchase from those aforementioned tent sales. I honestly wasn't blown away by it the first time, but it was still a great beer. As I sit with a new can in my hand (awesome design, by the way), I am hoping Focal Banger was worth the wait. Pours a hazy yellow with more than two fingers of fluffy, white head. The aroma is surprisingly resinous, spicy, and not atypical of a New England IPA. A large yeast character also dominates. The taste follows the aroma almost perfectly as this has a spicy kick to it and a hefty amount of yeast. This appears to have more in common with classic West Coast IPAs as there is a garlic/onion flavor that is really hard to shake. The Alchemist is so insistent on drinking straight from the can, so I obliged for the other half of this beer and I did actually pick up more of the tropical fruit juices and citrus which made the beer not only more flavorful, but easier to drink. Whether in the can or in a glass, an overall wet, dank hop juice flavor is present from beginning to end. Mouthfeel is what you’d expect from the style, but did have moments where it felt thicker than it should. It didn’t stop the experience as the array of flavors and hops made for a delicious brew. It odd to agree with the brewery’s “Drink from the Can” mantra, but it really did make a difference. Focal Banger is definitely a solid, solid entry into the American IPA category with its good use of hop varieties and high drinkability. Does it deserve to be mentioned in the same breath as Heady Topper? I get that they are slightly different styles, but I personally think that Focal Banger is more like Chalky Studebaker: It is great in its own right, but still has a long way to go to catch up to his big brother, Cliff (Heady Topper). You can agree or disagree with my opinion, but the fact that I spun that “Doug” reference into a beer analogy should earn me the highest respect.